rec. 2015/16, Hans Rosbaud Studio, SWR, Baden-Baden. Martin Anderson's now firmly established label, Toccata Classics, knows no fear. Browse their catalogue and encounter one unfamiliar composer after another. Rarity has no intrinsic virtue but Toccata's choices are usually sound and offer plenty of valuable experiences to the time-challenged classical listener. Born in South-West Germany, Josef Schelb became a pupil of Hans Huber in Basle and of Bernhard Stavenhagen in Geneva. Escaping armed service in the Great War, his career as composer and pianist was able to put down roots. He was less fortunate during the Second World War when the bombing of Karlsruhe destroyed his possessions including pretty well all of his manuscripts. These now reside at the city's Landesbibliothek and extend to some 150 pieces, some of which are orchestral. Amongst these can be found a concerto for violin, cello and orchestra and Music for Orchestra 1 and 2. There is also music for stage and for radio plays as well as a cantata De Sancta Trinitate for solo voices, choir and orchestra (1930). 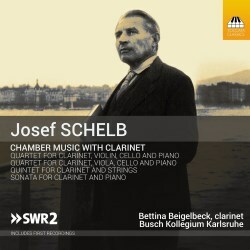 Going by these four compact clarinet-centred works - each in three or four movements and well-performed - Schelb was a dignified yet far from glum presence. The 1947 Sonata is capricious, florid and affluent in melodic foliage. Schelb ploughed furrows in fields well distant from those beloved of the revolutionary fashionistas of his post-war time. He avoided the avant-garde and dissonance. That said, the enmeshed undergrowth and seething foreground activity of works like the 1954 Clarinet Quintet present a far from facile conquest. His music has a luxuriously active Gallic spontaneity with ideas unwinding and interacting in what feels like an instinctive rather than a mapped progression. Frequently this activity combines with plangent regret as in the Lento of the Clarinet Quartet from the year after the Quintet. The skimming and scurrying Presto that follows (tr. 10) returns the listener to Schelb's gift for dynamism although it draws breath for contemplation. A final Allegro non tanto takes up the baton and predominantly presses forward with urgency. Just occasionally, as in the trudging start of the irresistible Adagio of the 1965 quartet, we can hear an echo of Kurt Weill. Schelb is his own man but he is likely to appeal to those who appreciate a voice occupying the enigmatic ground between Rawsthorne, Alwyn, Howells and Poulenc. His style between 1947 and 1965 remained stable. He had found his metier and was not going to slacken his grip on it. The site has already reviewed one Schelb CD so if you would like to progress further after this attractively recorded and vigorously performed Toccata entry then go for that Antes Edition disc.